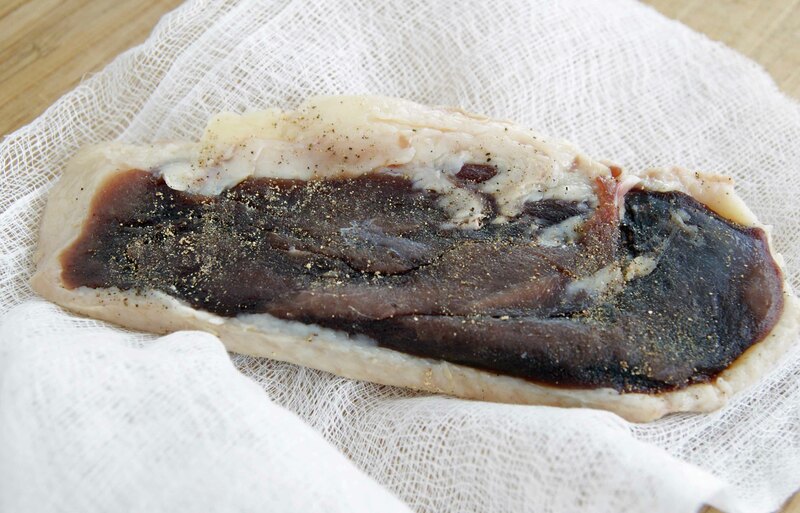 I haven’t tackled bacon or salmon yet, but I did recently prepare some duck prosciutto, which is a very simple (and relatively quick) recipe that’s great for someone just getting starting with this whole meat transformation thing. 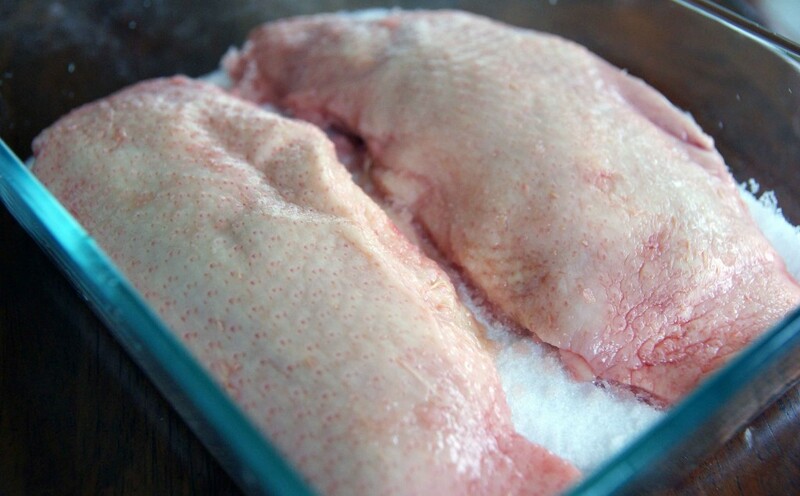 To make duck prosciutto, all you’ll really need (aside from the duck) is some salt and pepper. Really, it’s that simple. Start with a boneless duck breast (preferably from a naturally-raised bird), split into two. In a small baking dish or other vessel, pour about an inch of canning salt (not table salt), and lay the breasts on top, skin side up. Make sure they’re not touching. Pour another cup or two of salt over the top, so the duck is covered. Cover with plastic wrap and refrigerate for 24 hours. After 24 hours, the meat should start to feel firm and be a darker red color. Remove the duck, rinse well, and pat dry. Sprinkle each side with some freshly ground pepper. Additional spices may also work if there are other flavors you’re looking to incorporate. 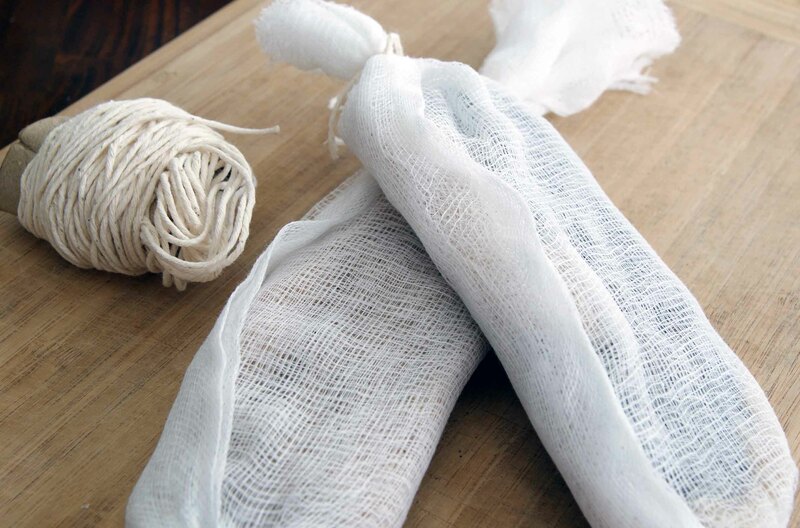 Wrap each piece in a layer of cheesecloth, tie it off, and hang in a cool, dry place (basement works great if it’s not too warm) for one week. After a week of hanging, it should be ready to go! Squeeze the center first – at this point it should be quite firm, but if it still feels a little squishy, give it another day or two. Remove from the cheesecloth (I feel like this is one of those dumb disclaimers – “don’t attempt to eat while still wrapped in cheesecloth…” – I seriously hope you don’t need that reminder), slice it thinly, and pair with some fruit, cheese, or dice it up as a flavor addition for some sautéed vegetables. 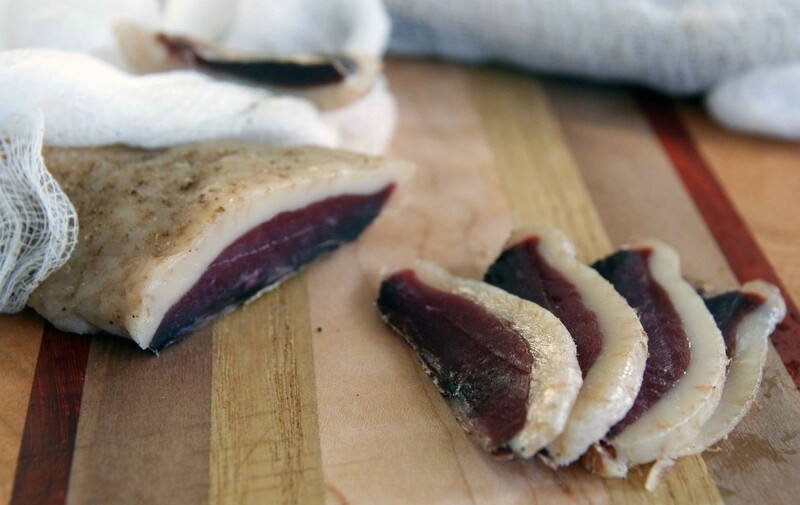 Congratulations – you just made duck prosciutto! Didn’t think you had it in you? Now that you know how simple it can be, I hope this opens the door for even further adventures in the world of charcuterie! Thanks for the recipe. I have tried it once and it was great. I have a quick question? Can I reuse the salt for the next batch? Great question, and one I’m not totally sure of. I would imagine that if you just keep the dry stuff, that would be fine. If you’re really desperate, you could probably spread it all out to dry completely, then reuse it. I’m not sure if it loses any potency, but I wouldn’t be concerned about cross-contamination, since pure salt isn’t exactly hospitable to e. coli and the like. Agreed! 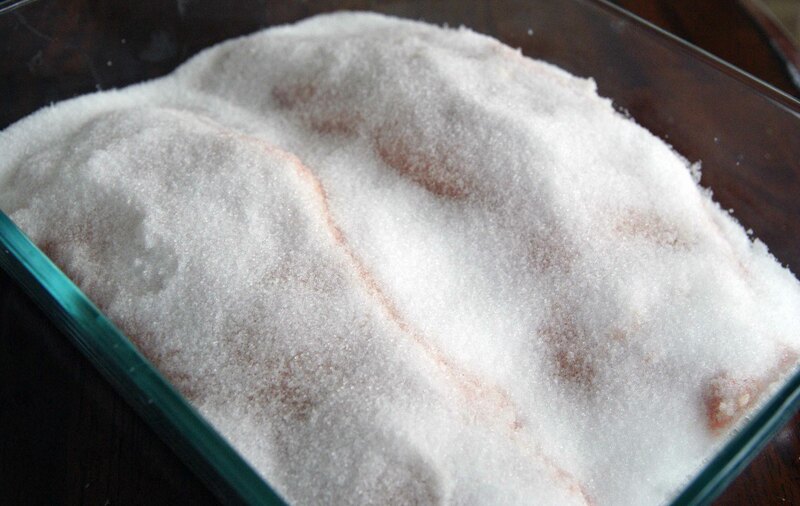 Just about anything that involves preserving meat in some form or another use a lot of salt. With good reason of course, but if you can save some of it, by all means, do it!